Many of us rely on Armbian Debian and Ubuntu images for our cheap Arm development boards since they usually offer better support than vendor supplied firmware images. 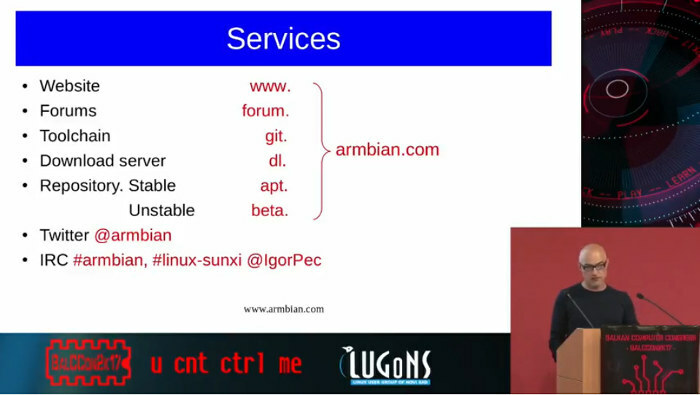 The community has just updated Armbian website, but the thing that caught my eye in the announcement was a link to a 45-minute presentation by Igor Pečovnik, working full-time on the project, that details the history about Armbian, and provides a relatively recent progress update as it was made at BalCCon – Balkan Computer Congress in November 2017. I’ve embedded the video further below, but first I’ll provide summary of the key point made during the presentation. It all started with Cubieboard (A20) as Igor was trying to fix some issues, and learn how to improve software support on the board. Several people joined his efforts on Cubieboard forums, and eventually Armbian website launched in mid 2014 running on the Cubieboard then ODROID-XU4 board as interest and traffic increased. The main motivations of the project was to solve various problems with low cost Arm boards including bad documentation, and poor Linux kernel and u-boot support. They also had to manage inexperienced users with high expectations. In 2016, 3D acceleration and hardware video decoding was implemented on Allwinner boards, 24 boards were supported, including the first 64-bit board and first boards with eMMC flash. They also moved to a dedicated build server. In 2017 (i.e. at the time of the presentation), 26 new boards had been added, as well as torrent download, the first netbook support (Pinebook), sources were merged in Github, and Armbian twitter account was opened. There are now 5 to 10 people working full-time or part-time on Armbian, and they get help from third parties, especially linux-sunxi community, which takes care of Linux and U-boot mainline support, some board makers providing samples, and random participants submitting patchsets. The broader community also helps with testing and providing feedback. Armbian has basically become the standard Linux for Arm SBCs (e.g. 200 downloads per day for most popular board), and all releases are based either on Debian or Ubuntu only, with CLI (server) or XFCE (desktop) images. The images come with optimizations such as a reduction of the number of write operation to the storage device, unified boot with ramdisk and UUID, DT overlays, auto-filesystem expansion, build essentials installed by default, and optimized DVFS. Some tools and scripts namely armbianmonitor, h3consumption, armhwinfo, firstrun, and armbian-config are included to facilization configuration and customization of the distribution. Failing to read the docs, lack of basic Linux knowledge, unrealistic expectations. At the 31:40 mark, Igor starts talking a bit more about the technical details of their build engine and how a bootable image is created with their scripts using either legacy or mainline (+some patchsets) Linux kernels. The build engine itself uses some optimizations like apt-cacher, scripts parallelization, ccache, and everything is built in memory. New stable versions of Armbian images are usually released every four months or so, but there are also daily / experimental builds. The final part talks about the project legacy: creating a community of users, useful documentation & tools, and promoting open source software. “There are now 5 to 10 people working full-time or part-time on Armbian” … wow, good to hear. So apparently there is a cash flow. From whom? I suppose the donations from users are not enough for that? I wish them success as they make wonderful product with very good support (even for Linux newbie as me). I use their product on two OrangePi. I was surprised too that so many people are working full time there. Which is not the case. Igor wrote that core team consists of ‘5 to 10 people’ on his slides and also mentions ‘project might create jobs’. Armbian is far away from something that generates an income for a bunch of people. While it is sounding like it is going in the right direction Armbian suffers from being coding people not educators I would suggest. Those people they describe as having unreasonable expectations are in fact customers ( they buy hardware )! Armbian needs more support from people with more customer support experience and more educator experience. They need a dedicated magazine or website to do projects, write ups and forum for new users, just like other hardware users of PC. At the moment things are spread around blogs and various sites and need more joined up thinking. Time for a few alliances with arm board, TV box makers and embbed people. Folk need to get more cooperative not combative IMO. So they are customers of the *hardware* vendors. And those hardware vendors are also responsible for raising all those ‘unreasonable expectations’ with unhonest/false advertising in the first place. Don’t forget that without those hardware sale Armbian would not have a market. Without terrible manufacturer software Armbian would be needed less. What Armbian sees as a problem, is a natural market that has the potential to make Armbian more profitable. At present Armbian think they have a great business if it was not for the dammed customers. You can lead a horse water but you cannot make it drink, holds true! I buy orange Pi’s because I need simple, robust boards that’ll get the job done in specific circumstances. I use Armbian because it’s a project that does the same. Not every bloody tech project needs to be about teaching the little kiddies to be #Koders, sometimes we just need a piece of software that does the job and does it well, without any politics. That’s Armbian, and it’s perfect. I donate a few bucks for every board I buy that I’ll end up putting Armbian on, I want it spend on dev work, not reaching out to people. Everyone KNOWS what armbian is. People saw a video by a youtube “Influencer” on this really cool cheap raspberry pi, so they bought one, realised the distro it shipped with was horrible, so they looked online and found Armbian. The Allwinner business model, hate the end user and let them spend years sorting their own software out. Also adopted by Orange Pi. I did the annual sunxi dinner at this fosdem, unfortunately I missed the Armbian guys because the big tables was split and I ended up with the 2 RISCV guys. It will be for next year. Armbian guys deserve a medal, and bigger donations from the manufacturers. Manufacturers images are a nightmare, with antediluvian kernels and horrible hacked SDKs. But I guess as long a Allwinner devs do not follow Rockchip devs to contribute directly to mainline and focus on LTS backports for Android tablets, the situation won’t change anytime soon. Well, +90% of what Armbian really is about is not related to what the majority of people think Armbian would be (just a user friendly Debian/Ubuntu distro for some SBC). So, if your statement is correct and accurate, then Armbian is in big trouble…. somehow i was expecting larger numbers of new boards (26 new in 2017).